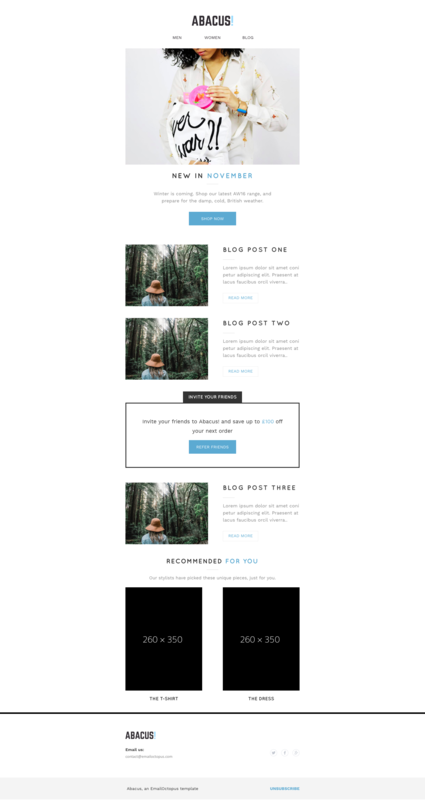 Free Email Templates, by EmailOctopus – Responsive email marketing templates. 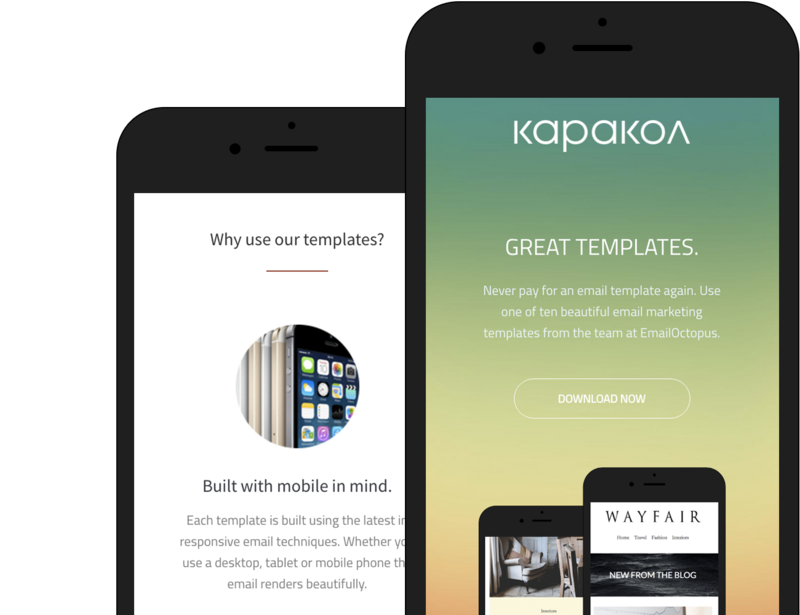 Eleven of the best email templates. All for free. We know creating HTML emails is hard. The tables, the confusing client support, the inline CSS. At EmailOctopus we want to make email better, so we’re giving away these beautiful email packs, completely free. 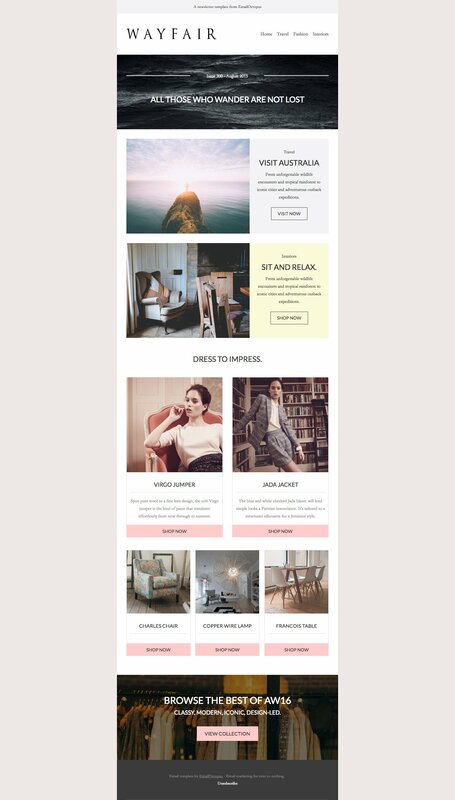 Whether you’re a fashion brand, established consultancy or new tech startup, there’s a template which fits your needs. Each template works across all major clients, and works with all email marketing platforms including MailChimp and EmailOctopus. We’ve even included a few extra re-opt-in emails, ready to help you re-permission your subscribers for the upcoming GDPR legislation. Karakol is designed with business in mind. 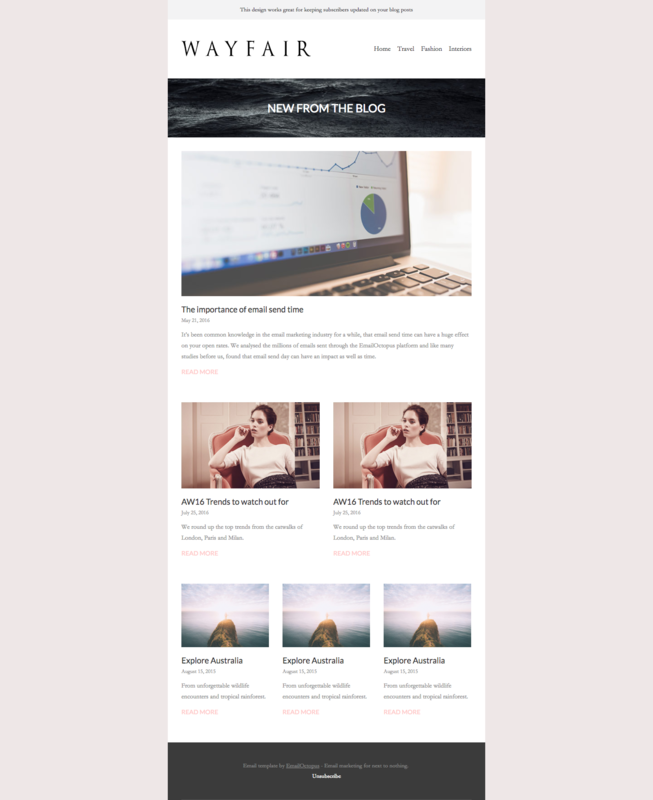 A professional, yet eye-catching, design set comprises of three fully responsive templates, a product announcement, blog post and transactional email template. The beautiful hero images, which gracefully degrade to solid colours in Outlook, draw the user in and make any content look stunning. 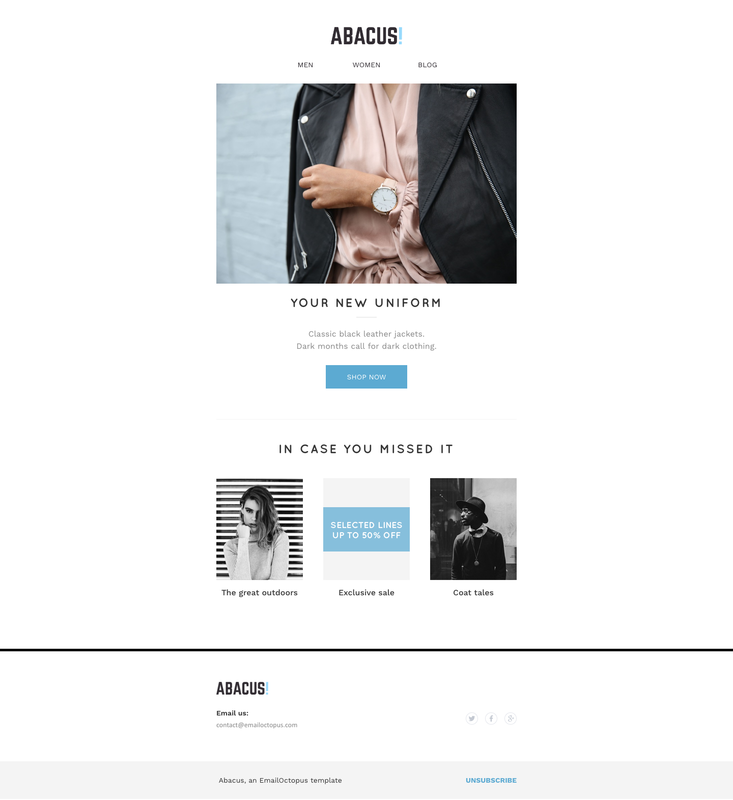 Abacus is a minimalist template series. 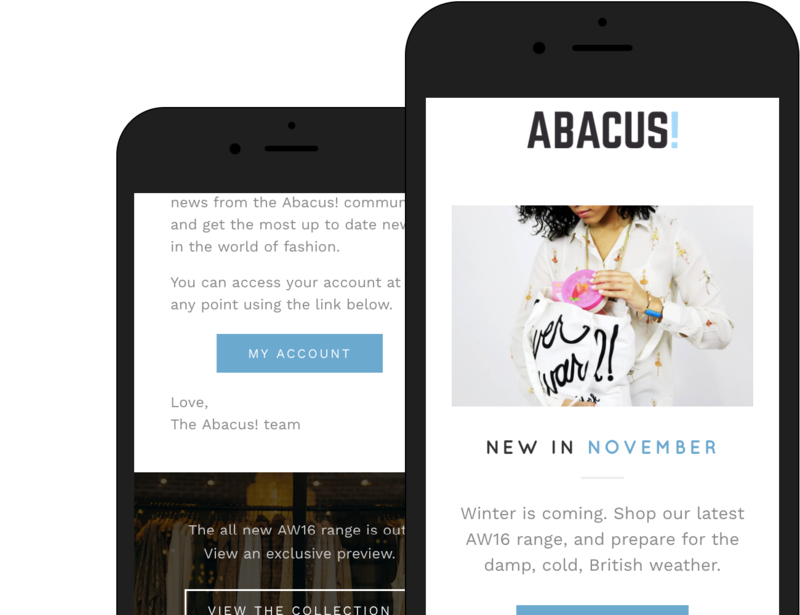 The Abacus set is made up of three fully responsive templates, a newsletter, product announcement and transactional email template. Each section can be copied and re-used with no limitations. 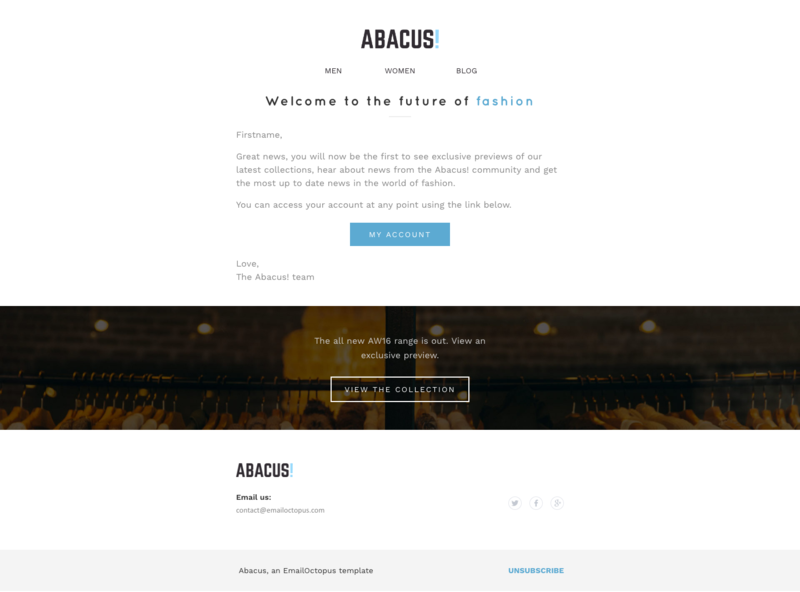 The beautiful, minimalist design makes the Abacus templates suitable to use across industries, including fashion, SAAS, technical and sporting brands. 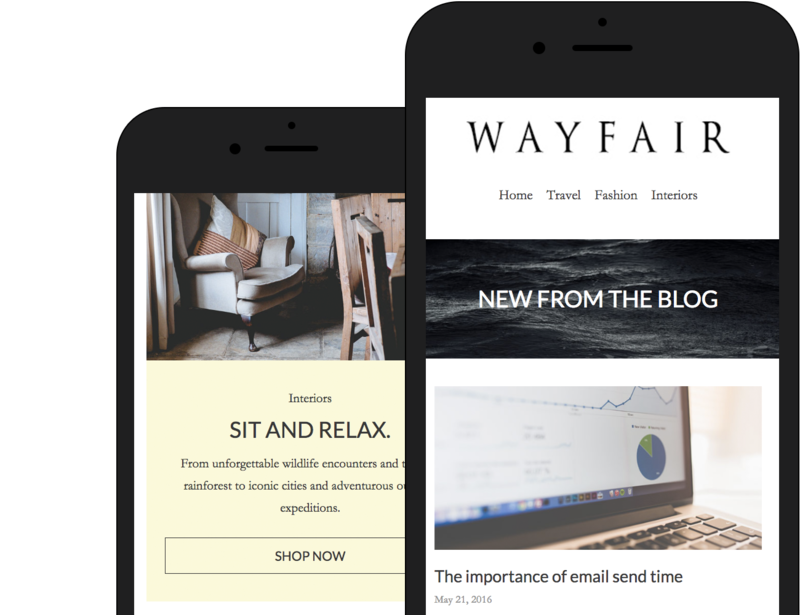 Comprising of three fully responsive templates, Wayfair is perfectly designed for a lifestyle or fashion startup. 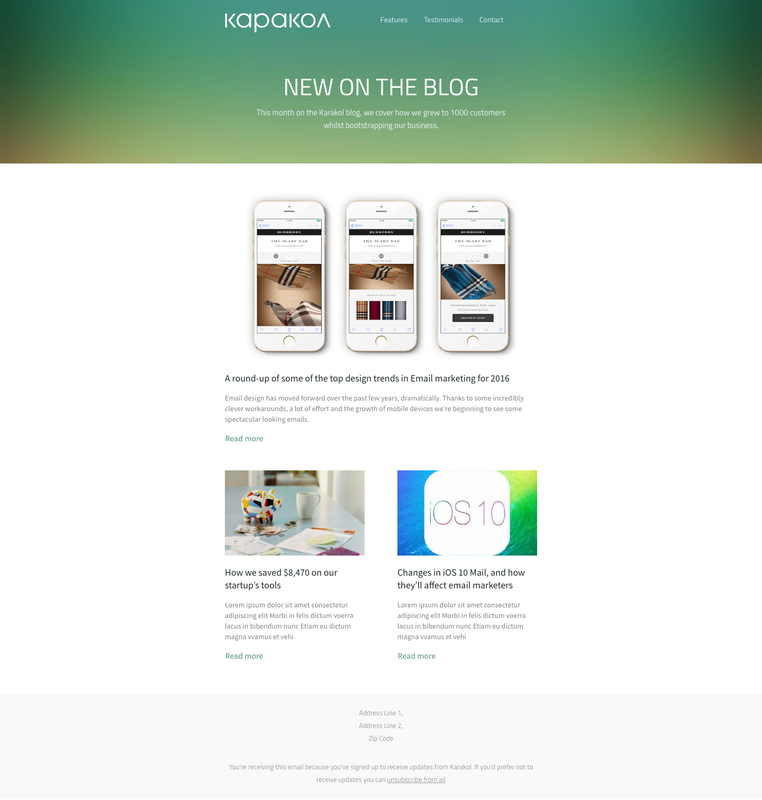 The three templates cover multiple use cases such as product announcements, blog posts, weekly newsletters or transactional emails. Which email service providers can I use these with? 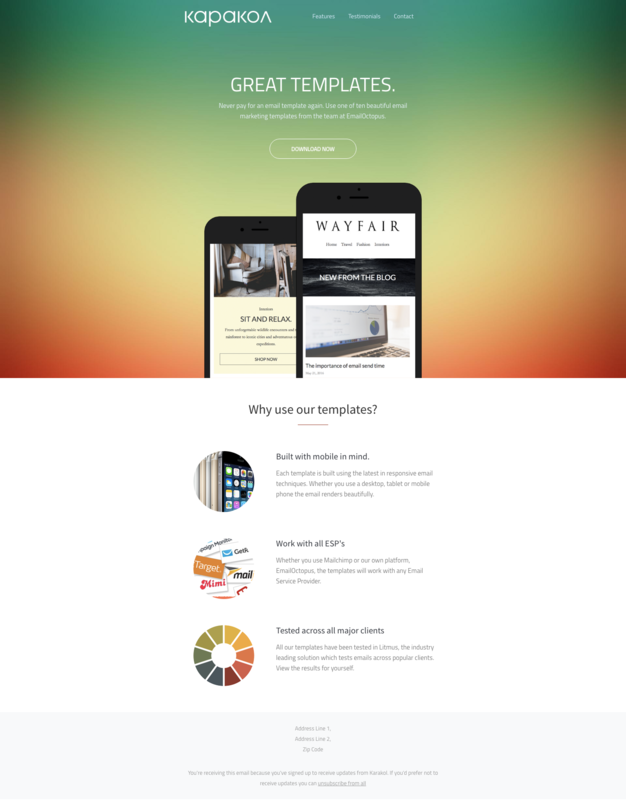 You’re free to use this template with any email service provider you wish. Our platform, EmailOctopus, has them built in and ready to use – but they’ll work with alternatives including MailChimp, Campaign Monitor and Constant Contact. How can I edit the text and images? The text can easily be edited through a WYSIWYG editor, which your ESP likely provides. More advanced changes can be made directly in the HTML. Which clients do these support? The templates are regularly tested through Litmus with all major email clients, including Outlook, Gmail, AOL, Yahoo and Apple Mail. Do they work on mobile and tablets? Definitely! The templates are optimised for all screen sizes and are coded using responsive media queries. Can I use these templates for a commercial project? Download now and kick start your email marketing. Regularly updated and free forever. 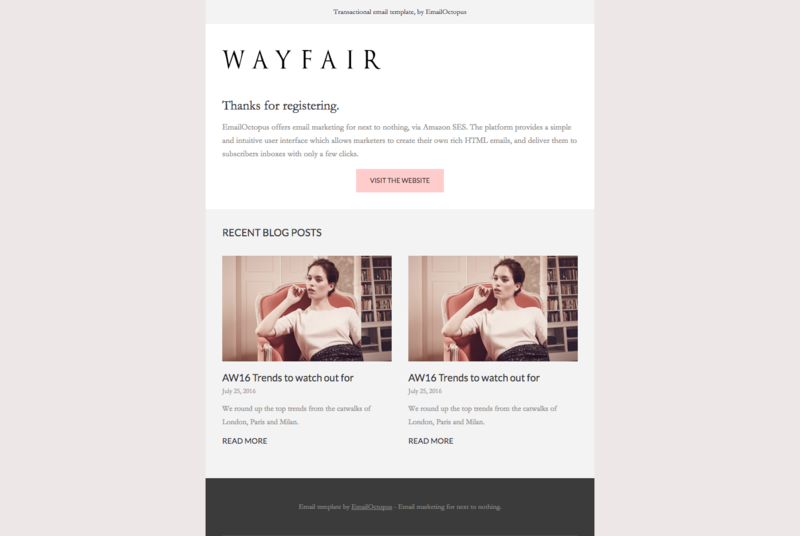 By sharing your email address we will occasionally share the latest in email marketing news. 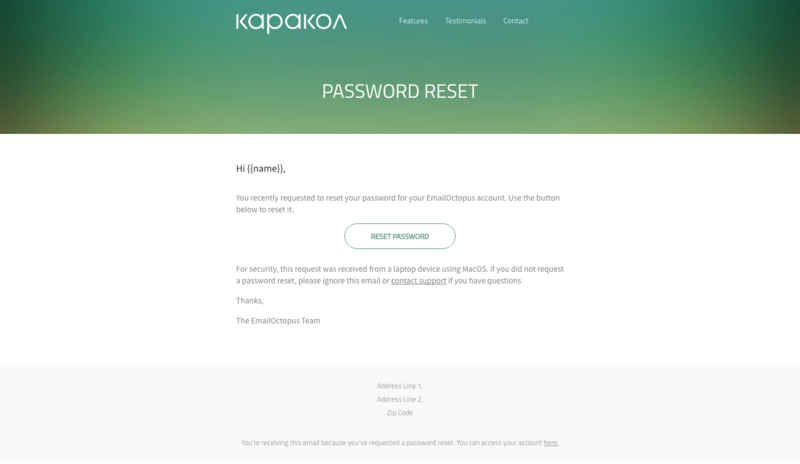 I don't want to share my email address, download now.